That isn’t a typo in the title. Today we’ve got a special feature recipe from The Veginner’s Cookbook by the foodie couple Bianca Haun & Sascha Naderer. 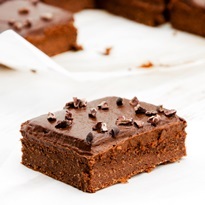 These healthy blender brownies are a sample treat from this starter guide for new vegans and the veg-curious. Like the healthy blender brownies sample recipe below, most of the recipes in The Veginner’s Cookbook have a nutritious slant. And all are dairy-free, egg-free, vegan, and vegetarian. But unlike this recipe, many of the recipes in this cookbook do use gluten and/or soy. Just a heads up for gluten-free and soy-free consumers! Preheat oven to 320ºF and line a 7x10-inch loaf pan with parchment paper. Add the oat flour and almond meal to your blender. Pulse until fine. Then, add the dates, bananas, cocoa powder, milk beverage, and salt and blend until smooth and creamy. You might have to scrape down the sides a couple of times. Transfer the batter to the baking pan and flatten the surface. Bake for about 25 minutes and let it cool off completely for 2 to 3 hours. Add all the ingredients to a blender and blend until completely smooth. You might have to scrape down the sides a few times. Once the brownies are completely cool, spread the chocolate avocado frosting on top and add the cocoa nibs. Cut into 6 brownies. You can eat them immediately, but it's better if you let them sit in the fridge for about 3 hours to let the frosting thicken a bit. This recipe is reprinted with permissions from The Veginner's Cookbook: The Ultimate Starter Guide for New Vegans and the Veg-Curious. 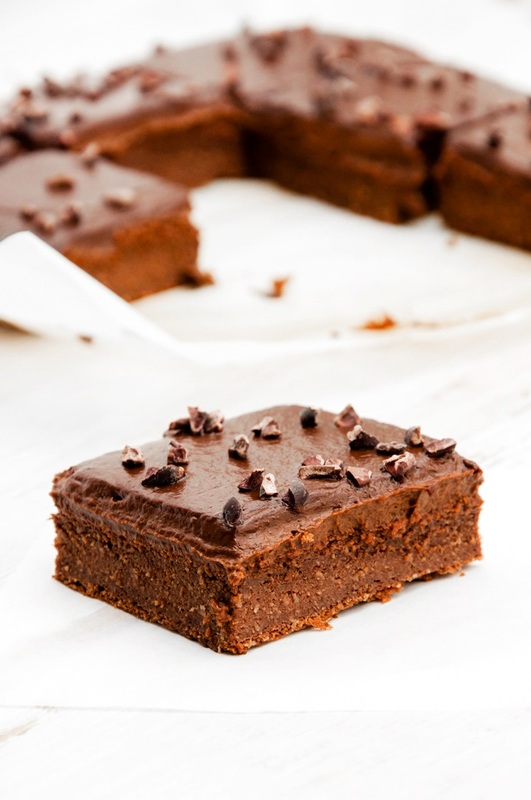 Pin these Healthy Blender Brownies! You can definitely use all-purpose or wheat flour. If you need gluten-free, you can try a gluten-free all-purpose flour blend. Nut flours (like almond) and coconut flour can’t be swapped 1:1 though. They will not perform the same. These brownies sound scrumptious! 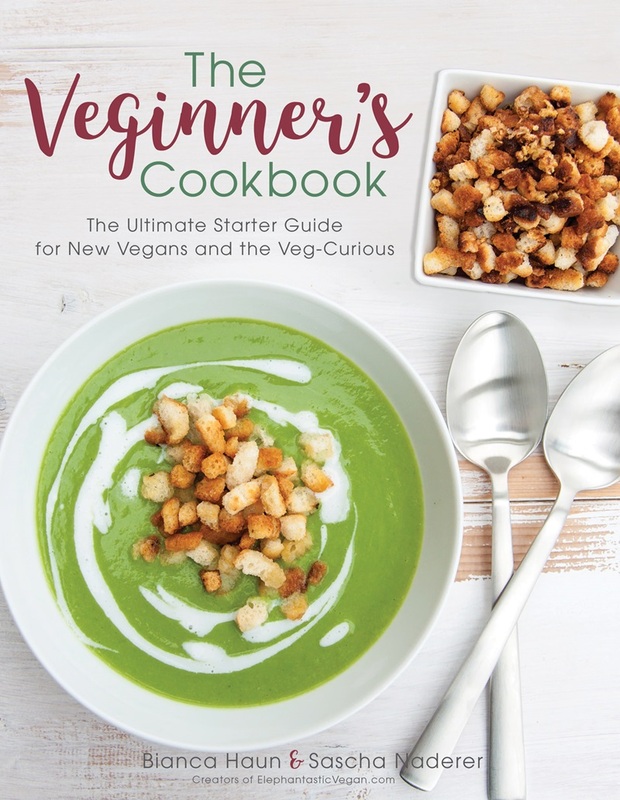 And I love the name of this cookbook – “Veginner,” haha, so cute! Yum! These look great. I haven’t had much success baking with almond meal and oat flour, I find them kinda finicky depending on what else you add. These look pretty easy and straightforward! The frosting looks great too! That recipe looks amazing and now I’m interested in the book too. I’m not vegan but I’m open to trying different things, so that book would be a perfect addition to my cookbooks repertoire! I’m loving this book so far. Easy yet delicious recipes. I haven’t tried these brownies yet, but now I have to!